"Many of the challenges facing our clients today must be addressed through both organizational shifts and digital process transformation, together leading to the desired business performance and measurable results. Precipio partners with our client teams and guides and supports them at each step." Precipio, LLC is a full service management consulting firm that supports clients to achieve their business objectives. Precipio applies proven, client-centric Business and Performance Excellence Strategies and Execution to create Client Value and lasting Business Process Transformation. We apply our broad and deep knowledge of Business, Operations, Strategy, Fundraising, Market, Channel, and Business Development, Customer Experience, Engineering and Technology, Portfolio and Program Management, Quality Systems / Lean Six Sigma, and Executive Leadership and Coaching to help our clients succeed. Precipio consultants have each earned their decades of experience helping companies of all sizes and market sectors achieve substantial and sustainable results at an accelerated pace with a direct financial and product, service, or mission performance impact. Precipio Organizational Excellence (OEx) is Precipio's Business Excellence Model that allows our clients to achieve their Business Objectives and efficiently meet their Customer Requirements, create the desired Customer Experience, and preserve and grow Business Equity. It elicits and requires the best performance from each Company Leader and Team Member, each Company Process, and the Company's Enabling Technology and Business Partners, in order to achieve Business Excellence. There are four primary drivers, connected in a loop, in the Precipio OEx model: Leadership, Change, Method, and Realization that lead to overall Organizational Transformation and Organizational Excellence. Many organizations have struggled with one or more of these areas, leaving a lot of potential performance unrealized. This is true even when broadly reaching programs, such as Lean Six Sigma deployments, are in place and well supported by Leaders and Staff. If all of the elements of the organization are not working together as a system, then top performance will not be achieved. There are numerous examples of well-intentioned process improvement efforts that failed to meet expectations (Ref Ph.D. Thesis, Failure of Quality Initiatives, Dr. Jerry J. Mairani, 2014). The implementations of current methodologies have not been able to step far enough back from process improvement (whether defect-based as in Six Sigma, workflow-based as in Lean, or quality-based as in TQM) and consider the organization as a system, and apply the principles across all levels of the company. Precipio's OEx approach does exactly that. 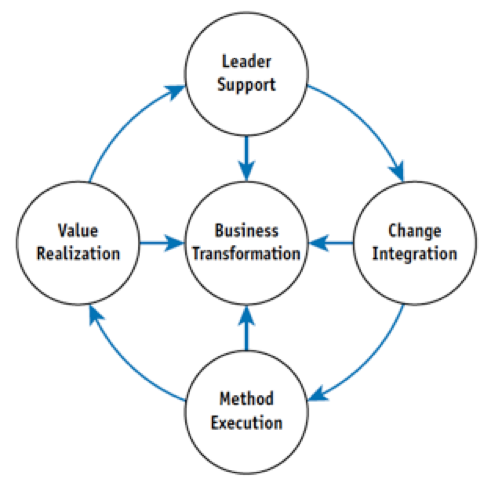 By applying transformation best practices (what have worked based on extensive experience and extensive peer-reviewed research), strategic thinking, technical and creative rigor, focused execution, and closed-loop accountability and partnership with the organization, Precipio has been able to achieve results not realized with classical efforts alone. A simplified view is: Decide what you will achieve, Learn how to achieve it, Do the actions, then Evaluate your performance and repeat the cycle with your new knowledge, and considering any external changes that have occurred. The Plan, Do, Check, Act cycle of TQM was not incorrect, just insufficient for the complex, transactional and data-driven Digital organizations of today. With few exceptions, even the simplest company must have an online presence and some form of cloud services to not just thrive, but to exist. Digital exchange of data and information is the default standard and the interconnectivity of everything has transformed what is possible, and the methods used to Design, Develop, Deploy, and Derive results in that environment must transform as well. This is the primary purpose of Precipio's Partners making their decades of consulting experience helping some of the world's top companies become more successful available through the Precipio OEx Model and our World-Class Framework. The framework for achieving Precipio Organizational Excellence is called Precipio Operating Model Excellence (OMx) and provides an organizational blueprint for both Execution (Daily Operations) and Transformational (Continuous Improvement) Excellence. 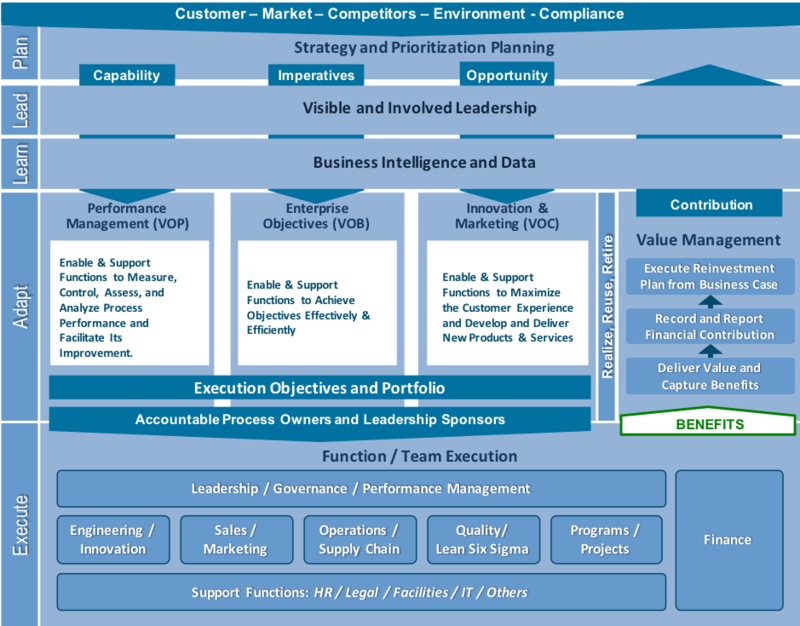 Precipio Operating Model Excellence (OMx) brings together the elements every organization needs to be successful into one holistic view, from the Customer to Strategy, Portfolio to Delivery, Process Design and Transformation to Performance Excellence, and supports all areas of the business with a coordinated view of delivering value and sustaining and continuously improving performance. Efforts that focus primarily on training, with or without projects, have left many organizations disappointed or frustrated with the lack of long-term business results. Even with leadership support and a "push" from the top, or the middle, or the bottom-up, the transformations they had hoped for fell short of expectations. Approaches including Total Quality Management, Lean, Six Sigma, ISO 9000 have provided valuable tools and methods, in various combinations, in an effort to facilitate organizational performance improvement and sustain quality outcomes. You can review in more detail here. However, only if applied properly and in the context of the overall Organizational Model, can the transformation and performance results be achieved and sustained. The Precipio Operating Model Excellence Framework considers the outcomes required by your Customers and helps you optimize performance across every function, so they work as an effective and efficient system, including Strategy Development, Portfolio Management, Digitization / Automation / Machine Learning / Robotic Process Automation, Performance Management, and Quality Systems, while leveraging those elements of Lean Six Sigma and other related methodologies only as required, to deliver Value. This provides an Organization an OMx Execution Blueprint tailored to their Customers, Products and Services, Culture, Goals and Objectives, and Organizational Personality. Each Organization is different and behaves differently and therefore requires a flexible solution to achieve success and the Precipio OEx Business Excellence Model and OMx Framework provide it. Next Event:: Do I Need a Data Science Transformation? Transformation Coaching Event on Jun 1 2017 at 2pm EST. Transformation Enablement Event on Jun 16 2017 at 2pm EST. $2 Billion Transformation Event on Jun 22 2017 at 4am, 12:30pm, and 8pm EST. Want to know why the Precipio OMx Operating Model is important? Listen to a leader at Cisco, one of our top Transformation Partners.